With Driveboo, you can easily compare different car rental offers in Manchester and book your rental car directly online. If you want to get as much sunshine as possible in Manchester, it is best to travel by rental car between May and July. Manchester is a city in the north-west of England, in the county of Lancashire, on the River Irwell. 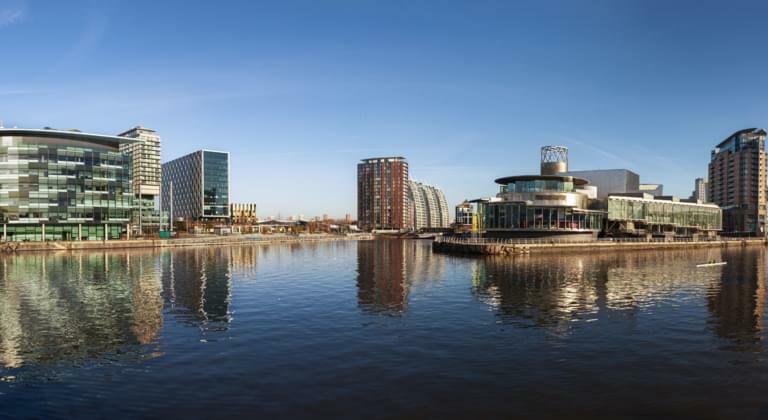 It is part of the area known as Greater Manchester, which also includes other cities, including Oldham, Rochlade, Stockport, Bury, Bolton and Salford. The city itself has 449,000 inhabitants, and Greater Manchester has as many as 2.6 million inhabitants overall. The city is considered an important shopping metropolis of the country, second only to London. The shopping possibilities are countless and varied. With a rental car, you can not only store purchases conveniently in the boot, but also explore the whole city and its surroundings. Manchester is also a joy for football fans, as it is known for its two football clubs, Manchester City and Manchester United, both playing in the English Premier League. Where is it possible to rent a car in Manchester? In such a big city, it is relatively easy to find a car hire office. However, if you travel by plane, it would definitely be most convenient to pick up your rental car right at the airport. Manchester Airport (MAN) is a great place to start your English adventure! Other airports located fairly close to Manchester are Leeds Bradford Airport (LBA), Liverpool John Lennon Airport (LPL) and East Midlands Airport (EMA). Each one of these provides car rental desks or offices, from where you can easily pick up a car to use for the duration of your trip. If you rent a car in Manchester, you can embark on various interesting trips in the area. For example, you can relax in the nearby Heaton Park. Also definitely worth a visit is Liverpool, the home of The Beatles. While there, you can explore Paul McCartney's home, visit the Liverpool Cathedral or go to the Walker Art Gallery. Another amazing destination is Crosby Beach with numerous sculptures by the artist Anthony Gormley. Nature lovers will enjoy the Peak District with its beautiful and diverse landscape full of green valleys, cliffs and steep walls – it is a perfect spot for a day of hiking.